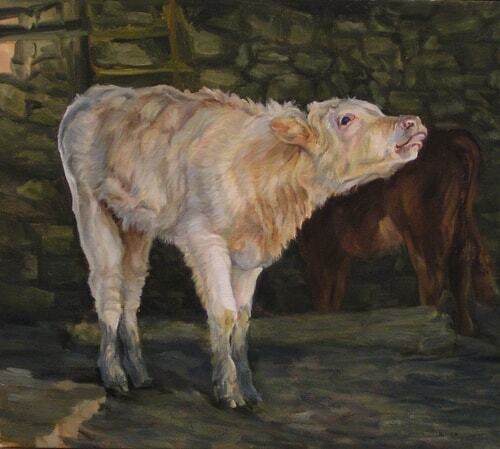 Contemporary realist artist Diane Weiner paints intimate bovine portraits, capturing each animal’s personality. See more by visiting her website. I am a contemporary realist artist who creates my work in series. When a subject resonates with me, I become intrigued with the multiple ways I can interpret and represent it. My cow series in oil was sparked by a road trip with a friend to parts of rural Frederick, Maryland. I encountered a field filled with cows, all of whom had name tags in their ears instead of numbers. The sun was starting to set and the sky beguiled with vivid streaks of magenta, yellow and teal that reflected on the cows. From that moment on, I knew I was destined to explore a new body of work on bovines. My cow series represents sixteen years of exploration of bovines, studying their personalities, interactions, general nature and anatomy. I complement my decades-long classical training in the style of the Great Masters with more abstract colors to drive an emotional response from the viewer. Composition, gesture, anatomy, modeling and paint application are all instrumental in achieving the final result. Many of my pieces are closely cropped, confronting the viewer with attitude while others represent more nurturing moments. Still others highlight their physical interactions. Though I am located in a city, I like to take frequent trips to farms for source material and to connect physically with my subjects. Usually I find a friendly and bemused farmer who will allow me on their property so I can observe, photograph, sketch and pet the cows. I use this opportunity to study the cows’ eyes to obtain details and other information unavailable in photographs. This intimacy also reinforces my knowledge of their anatomy visually and through the tactile experience of touching their wet noses, rough tongues, fur and bone structure. All of these sensations are so alive when I return to my studio that while I am working, I feel as if I can still smell the cows and feel their touch as they might poke their noses into my pockets in search of some goodies. They are in my mind and heart and saturate my senses as I paint. In my studio, I play with the photographs—sketching, combining some images, cropping other, and making changes with color and juxtaposition that seem to suit the mood of each image. What is most important to me is the viewer’s visceral reaction to my work. A juror once commented that my paintings “transcend the immediate subject by linking the living spirit of an animal with our own.” Some clients see resemblances to a family member in the painting they select and retitle the piece appropriately. To me, this connection is the ultimate compliment. Artist Diane Weiner invites you follow her on Instagram.